Took a month off from writing so that I would spare you all yet another year end recap. 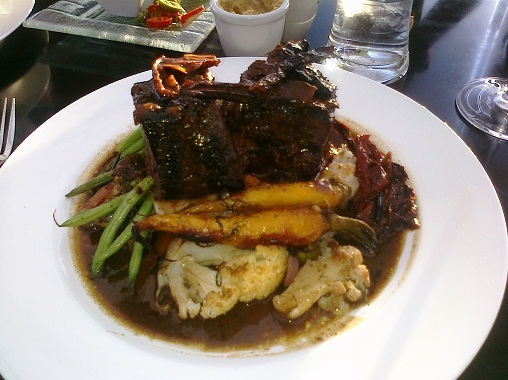 Suffice to say that 2011 had its ups and downs and a whole lotta great wine and food. And we're getting 2012 off to a busy start. New Year's Eve - A few of us met at Debra B's atelier. We shared a few bottles of Kirkland Champagne (yep, Costco imports actual Champagne under their label - and it's pretty good and only $19.99), a treasured bottle of 2004 Caymus, Shai Adome (of course), and several others. Shawn got pretty toasted, so the Goddess ended up being the designated driver. Oh wait, I'm always the DD! Of course, we had to wait until I was back at the legal limit...thank goodness for Shawn's Breathalyzer! New Year's Day at Rico's - Too much amazing food, too much delicious wine. I think I was in bed by 8 p.m.
Day after New Year's Day - Slept late and watched the replay of the Rose Parade. Dinner with Shawn at the Tam O'Shanter - Some wine, some food, some single-malt Scotches, some really strong coffee. High point was the 'back of house' tour provided by Manager Brien McNally. Interesting to see what changes may take place in the kitchen over the next year or so. Second weekend of the New Year - Went south to Poway to visit old friends and brought wines made by friends - Shai, Laraneta, Four Brix. Irene's guests were an eclectic mix, and there were some kindred wineaux there, so a good time was had. Next day, north to Escondido and Temecula. One couple at Irene's suggested Orfila Vineyards and Winery and told us a lot of the history of the winery, so we figured what the heck. It was on the way. We were glad we went. 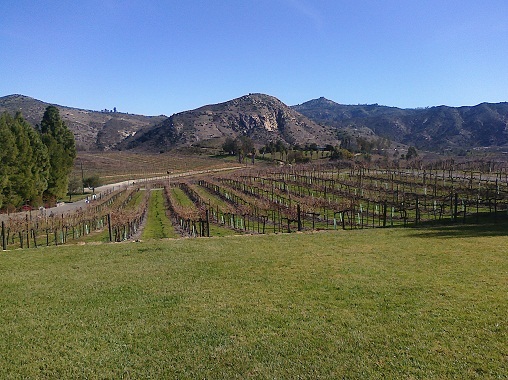 Orfila is a boutique winery in the San Pasqual Valley agricultural preserve, about 30 minutes north of San Diego, just 5 minutes off the I-15. 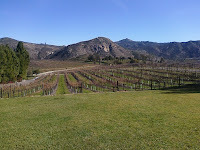 Executive Winemaker Justin Mund and his team produce premium Rhône-style wines from grapes grown on the hillside estate. Located approximately 15 miles from the Pacific Ocean, the vineyard estate receives cooling coastal breezes that balances the heat of the region. We were welcomed by the lovely Shaudia, recently relocated from Florida. She poured us all the wines on the menu! We also got a tour of the vineyard and the winery, an unexpected plus. 2010 Chardonnay - Arroyo Grande fruit - clear, pale gold, well-balanced acidity and fruit. 2010 Estate Rosé - Saignéed from Sangiovese and Syrah grapes. Dark rose color, watermelon and rose petals in the nose, very dry with flavors of tea and hibiscus. Refreshing. Bought 2 for $15 each. 2008 Estate grown Sangiovese - Ripe, fruity. Bought a bottle for $25. 2008 Estate grown Cabernet Sauvignon - We both liked this a lot. Bought a bottle for $25. 2007 Zinfandel - Loved this. Bought a bottle for $22 and poured it later that week. Wish I'd bought more. More on that later. Back in the car and out to the far reaches of Temecula to find Doffo Winery. I have to say this carefully. We liked the wines. We thought they were well-made. We were warmly greeted and well-treated. We had a great time. Young Damian Doffo was enthusiastic and knowledgeable. What we still don't quite understand is the pricing. The red wines ranged in price from $59 to $110 - which for us means that these are wines we can't afford to buy very often or very much. Doffo is very small production, and clearly has a loyal and happy clientele. We purchased a bottle of the 2009 Malbec - Beautiful, floral nose, cherry, anise and nutmeg in the mouth and $59. 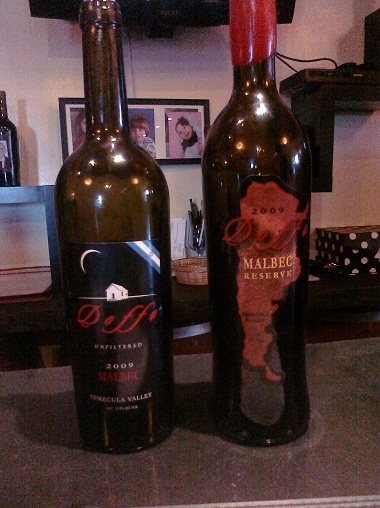 We also liked the 2009 Reserve Malbec (only 80 cases made), but at $110, we couldn't afford it. I look forward to seeing this winery's new releases, and I'm happy they have patrons who keep coming back. They are working the 'cult' wine crowd, and doing a great job. It was getting late in the day, and we thought we'd make one more stop, but the Sunday afternoon crowds in Temecula are kind of amazing, and we weren't up for places with stretch limos and crowds, so we headed back to Callaway - not for the wines, but for the Meritage Restaurant. We were glad we did! Alfresco dining with a roof and windows, a wine list that included more than just the winery's wines, and a view of the valley and the sunset that were the perfect end to a lovely day. We chose a 2007 Don Rodolfo Vina Conejo Costas Tannat from the Cafayete Valley, Salta, in Argentina. This Tannat was grown at a seriously high elevation - 5900 feet! Flavors of tobacco, chocolate and blackcurrant with velvety tannins and a long sweet finish made the perfect accompaniment to my amazing braised short ribs and JD's tomatoey, cheesey ziti with pork, beef and some other meat (turkey?) meatballs. A cup of strong coffee finished off the meal and we headed home. Did you know that Temecula is the same distance from Burbank as Santa Barbara? I'm still leaning more towards the Central Coast wines than South Coast, but Temecula is clearly making some changes - like growing grapes suited to hot weather. More visits must occur! We took a break for a couple of nights and then hosted the first official meeting of the Goddess' tasting team at our hangout, Fab's Corner Cucina. I was trying to create an elegant name that would signify the seriousness and passion of the tasters as well as the enjoyment of wine and food. Of course, every time I try to control anything, it never turns out quite as I...hope. So, Wednesday, January 11th, 2012 turned out to be the first official meeting of...wait for it...the Wine Goonies. Sigh...a Facebook page will no doubt be following shortly. Our motto: It's so good in the mouth. That was something I actually sighed while tasting one of the wines. So mea culpa. There will probably be tee shirts, too. Stay tuned. ANYWAY - The grape to be discussed that night was Zinfandel. Attendees Debra B, Xochitl, Rico, Amelia, JD, and the Goddess opened 7 diverse Zins from all over CA. Other members Marya and Shawn were otherwise engaged, but will attend future sessions. Zinfandel is a variety of red grape planted in over 10 percent of California vineyards. DNA fingerprinting revealed that it is genetically equivalent to the Croatian grape Crljenak Kaštelanski, and also the Primitivo variety traditionally grown in Puglia (the "heel" of Italy), where it was introduced in the 18th century. The grape found its way to the United States in the mid-19th century, and became known by variations of the name "Zinfandel", a name of uncertain origin. 2010 Seghesio - Sonoma - Medium ruby color; spice, pepper, walnuts, pie cherry, soft cheese, grassy notes in the nose. The pie cherry (canned cherry filling) notes continued into the brown sugar finish, while some of us tasted black and white pepper and anise. Nice tannins, acidity and alcohol balance. 14.8% alc., $26.99 We all felt the price was a bit high for this wine, but we were happy to drink it. 2009 Beekeeper - Rockpile (Sonoma) - 81% Zinfandel, 19% Petit Sirah; Deep purple, opaque color; eucalyptus and green strawberry, Christmas spices, dark dark cherry, coffee, mocha, chocolate dust in the nose; well-balanced mouth feel, coffee, dried roses, black cherry, floral potpourri, vanilla with a long sweet finish. We all really loved this wine. Doesn't really need food, but would pair beautifully with pork chops, rosemary, even a really good burger. 15.3% alc., $60 - only 124 cases made. I probably should mention this is the first release by my friend and mentor, Ian Blackburn, of LearnAboutWine. 2007 Nevada City Winery Late Harvest - Sierra Foothills - Debra threw in this dessert wine just to finish off the meal we had after tasting all these wines. It was light and sweet and demanded chocolate, so we shared a piece of flourless chocolate cake. 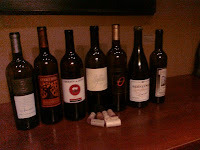 As you can tell, Beekeeper was the favorite wine of the night, followed closely by Orfila and Seghesio. It was a good start for our band of hardy tasters. Next month we taste Sangiovese. Now we need tee shirts.